The Viking house and home, like in many societies would vary somewhat depending on the area and materials available. However there were popular designs that are considered to be the primary construction type in Viking times and this was the called the Viking longhouse. In this home or Viking longhouse many things would occur, cooking, sleeping, daily chores and much more. A fire was the heart of the Viking home, important for the already mentioned cooking and also for heat and warmth in a cold Scandinavian winter. It was likely in Viking times to have many people living in one home, although smaller homes were common also. There might be animals too should they not be able to live outside in the cold winters. The Viking home was really a place for all. The Viking homes look very much like houses do today, rectangular bungalows with a pitched roof. One difference was that longhouses could be build below ground level, perhaps to ensure that wind and cold would enter the home. Depending on the materials available and the location of thinking of the different groups of Vikings, there was some variety to the type of houses constructed in the Viking era. 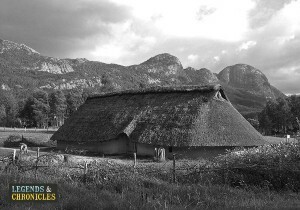 In lands with limited wood supply, stone or peat houses were common. These houses were typically dug into the ground deeper to reduce the amount of materials needed to construct the walls. In some locations in Scandinavia, thatched roofs were common, in others wooden shingles were preferred. Some houses even had growing roof’s with moss and grass growing wild on the roof adding insulation to the home. The outside render was also different depending on the settlement. Some Viking homes would have bare wooden walls, this would require excellent and well fitted craftsmanship to keep the wind and elements out. Other settlements would use peat or mud to add a protective layer to the walls. Like its name the typical Viking house was long and straight a rectangle shape with a pitched roof. The length of the longhouse could be up to 30 metres in length which is around 90 feet. The width of the Viking home would be typically up to 2 metres, or around 5 feet, hence the name longhouse. Viking longhouses were one storey tall homes, although with the roof as well the height could be over 3 metres or 12 feet tall. Inside however there was only one floor and the pitched roof would make it easy for rain to wash over the house. The biggest longhouses found have been during excavations are rather large. In Denmark many example of longhouses have been found measuring up to 50 metres long, which is around 150 feet. In Norway even bigger longhouses have been found, with one in Lofoten measuring up to 83 metres in length, a staggering 249 feet. 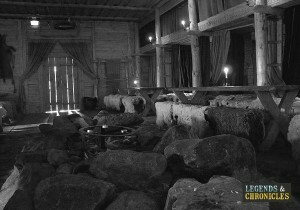 The interior of a Viking longhouse. The inside of a Viking home was pretty basic and almost spartan. As we mentioned the home would commonly be below ground level with a centrally located fire to heat the home, and also to cook food on. Because Viking homes had few windows if any, the fire would also be the primary light source so they could see what they were doing. The home itself was typically one room only, but in some cases there would be separate areas for humans and animals, as it was quite common for the Viking to keep animals indoors sometimes. Sometimes the slaves would be kept in separate sections too, and n some of the wealthier homes, there were often more than one room. Running down the length of the home on both sides were low wooden benches. These benches would be used to sit or to sleep on, providing a weary Viking with a place to rest his head. Living in Scandinavia gaves the Vikings access to many natural materials, particular wood. There was an abundance of trees in Viking times, and wood would be the primary building material used when constructing a home. Oak was the favoured material for its strength and density. The longhouses roofs would be constructed from either wooden shingles or would be a thatched roof. Both methods would keep the Vikings safe and dry in their homes during storms or winters. In some locations in Scandinavia wood would not as plentiful or available. In these cases the Vikings would build houses out of stone. The walls would be constructed stone by stone, and the outside would be lined with peat or moss. This layering would add insulation to the house and the moss and peat would often be used on the roof also. As we already spoke about, the typical Viking home was the longhouse and this was built almost entirely from wood. Upright wooden beams planted below ground level would form the foundations, with wooden a-frame trusses providing the support for the pitched roof. The level of pitch the Vikings used would depend on the type of roofing they planned to use, wooden shingles could be applied to any level of pitch, but if thatched roofing was going to be used the pitched has to be steep to ensure the water runs off correctly. Onto the wooden frame the roof would be added, either wooden shingles or thatching. The walls of the Viking home would be constructed in a number of ways. Wooden wattle was one choice, which is woven sticks lashed together would form the base. On top of this a layer of render would be applied, either mud or peat to add protection elements and layers to the wall. Another choice was simple wooden boards, this method required more craftsmanship to ensure the walls were able to protect the inhabitants from the elements. its likely even with this method sometimes an additional render layer would be added. The Viking home served many purposes, cooking, working and resting were all performed in the Viking household. Spartan in feature, but warm due to the centrally located fires, the Viking home would provide a much needed respite in the cold winters, when many Viking folk would hibernate and keep warm indoors.